Last weekend Jayne and I ventured across regional New South Wales to Bathurst, a town where Jayne was going to present her Master Class to a group of switched on dental front office staff. We pre-booked and paid for our accommodation well in advance, at a small boutique hotel that I researched on the internet. Our drive to Bathurst took us South West to Goulburn where we dropped in to see a client there before swinging northwards to Bathurst. Anyway, let me tell you what happened when we arrived in Bathurst at our hotel. First of all, we were greeted at the front doorway by Christine, the owner. And we were greeted by name. Christine asked us to bring any luggage in so we could take it to our room, but because we had a reasonable amount, we left it and entered her hotel with her, where she immediately made us feel right at home. And this was easy for Christine to do, because for the past fifteen years this small hotel had also been her home. So Christine proudly showed us to our room, but firstly she showed us each of the other five guest bedrooms [which on our first night there were vacant]. More guests were arriving the next day. The building, which had previously been owned by the Church of England, had originally been the residence of the Anglican Bishop of Bathurst, and of course, with such history, had been subject to many Heritage Orders by Council to maintain its original beauty and charm and integrity. Christine proudly showed us how Council had restricted her renovations to allow only one ensuite bathroom, with all the [separate] bathrooms of all other guest rooms being located together with raised flooring to accommodate hidden plumbing. Following on from the bedroom tour, we were then guided to an upstairs open verandah, and then on through the downstairs lounge area, dining area and library, as well as into the very large kitchen and adjoining bar area. Each room was perfectly decorated with period pieces as well as with ample reading material. The tour then continued on through the connecting chapel, and into the garden via the grand downstairs balconies and verandahs. Trees and ornaments and purposes of things in the garden were specifically explained, along with wonderful historic stories. We also had the opportunity of meeting the Golden Girls [the chickens] who were housed in a heated five-star hen-house, and who provided fresh eggs for omelettes over the next three days. Over the next three days Jayne and I developed a distinct and definite friendship with Christine as she happily shared tales of how she ended up as the owner of this wonderful five-star boutique hotel….it was indeed a wonderful experience. So what’s the point, David? Well of course, what this experience reminded me was that we all, no matter what our business, need to be able to share with our new guests and customers an Ultimate Guided Tour of our place of employment. Of our house of business. Do you have a guided tour for your dental office that is systematic as well as being interesting and intriguing? Do you have stories of interest that you can weave into your guided tour to explain the history of your dental practice, or to share some historic adventure? Or is your tour [if you have one at all] simply just a word description of your equipment and facility? Your guided tour should be interesting and informative, just like a tour of an historic castle or historic home. Because without the stories, historic homes and castles can just appear like a group of old bedrooms and kitchens, separated by suits of armour and drawing rooms. It’s the tales of intrigue and history that really tie those tours together. How can you make your Dental Practice Tour an experience to remember? Maybe your team can brainstorm some of their significant memories of your dental practice. Guided tours should be an integral part of your new patient experience in your dental practice. 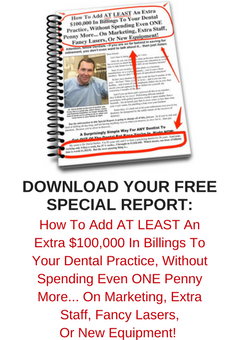 And that’s simply because it’s an easy way to stand out from other practices in your area….because none of your competitors are doing them. If you make the tour an exciting story filled adventure, you’ll have your new patients, as well as your existing patients, screaming your praises across the land. And with that they will be creating a line of word of mouth referrals beating a path to your door.